we possess to create delicious tasty sandwich offerings. Our sandwiches start with our made from scratch breads and are made with quality meats & cheeses that have been freshly sliced each day. Don't forget we have salads, & soups! Need some crunch with your sandwich?-grab a bag of Miss Vickies potato kettle chips. a Jr. sized oatmeal chocolate chip cookie & a pickle wedge. -Each sandwich comes with a Great Harvest oatmeal chocolate chip cookie (jr. size) & pickle wedge. Honey Whole Wheat, Great Harvest spicy pecan chicken salad, provolone, tomato, & lettuce. 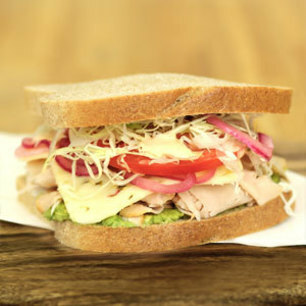 Honey Whole Wheat, turkey, swiss, Great Harvest seasoned mayo, sprouts, & fresh avocado. Honey Whole Wheat, ham, egg salad, chunky guac, cheddar, tomato, red onion, s&p, & lettuce. Honey Whole Wheat, turkey, Great Harvest stuffing, house made cranberry cream cheese, & lettuce. High-5 Fiber Whole Wheat, provolone, poppy seed dressing, fresh apple slices, tomato, red onion, cucumber, & spinach leaves. Open faced on sourdough, Great Harvest ranch cream cheese, pesto, cucumber, tomato, oregano, balsamic vinegar, & olive oil. Sourdough, apple slices, green pepper, onion, tomato, jalapenos, spicy brown mustard, s&p, & a touch of O-Town Pineapple Jalapeno jam. Honey Whole Wheat, turkey, provolone, Great Harvest seasoned mayo, spicy brown mustard, cucumber, tomato, & lettuce. Bacon, lettuce, tomato, & Great Harvest seasoned mayo, piled on Sourdough. Creamy peanut butter & jam on Honey Whole Wheat. Sourdough, Great Harvest egg salad, BH cheddar, bacon, s&p. Sourdough, roast beef, cheddar, horseradish, tomato, lettuce, & Great Harvest seasoned mayo. Sourdough, turkey, Genoa salami, spicy brown mustard, pepper jack, tomato, & green pepper. Pumpernickel Rye, pastrami, swiss, sauerkraut, & thousand island dressing. Provolone & cheddar cheese grilled on sourdough. Sourdough, turkey, bacon, tomato, Great Harvest cranberry cream cheese, spicy brown mustard, pepper jack, s&p. Sourdough, bacon, turkey, cheddar, tomato, Great Harvest ranch cream cheese, spicy brown mustard, & jalapenos. Sourdough, pepperjack, tomato, red onion, green pepper, salt & pepper, pesto, olive oil, oregano. Dressings: Buttermilk Ranch, Italian, Raspberry Vinaigrette. Lettuce & spinach leaf mix, genoa salami, provolone, olives, green pepper, & onion. Lettuce & spinach leaf mix, bacon, tomato, swiss, & cucumber. Lettuce & spinach leaf mix, dried cranberries, walnuts, apple, & blue cheese crumbles. Honey Whole Wheat, Great Harvest seasoned mayo, spicy brown mustard, cucumber, tomato, & lettuce. Sourdough, Great Harvest egg salad, cheddar, bacon, s&p. Honey Whole Wheat, tomato, cucumber, s&p, onion, green pepper, sprouts, lettuce, balsamic vin. & oil.